"Avery S. Hoyt, Chief, Bureau of Entomology and Plant Quarantine." Bureau of Entomology and klant Quarantine Washington 25, D. C.
plant products to that country. des Vegetaux (Plant Protection Service). be consulted for the exact texts. Decree of August 23, 1898, on the govethment and administration of Algeria. Decree of June 10, 1911, prohibiting importation of dodder. Law of July 15, 1921, prohibiting the importation of grapevines into France and Algeria. Order of February 14, 1922, as amended July 1, 1939, establishing basic regulations and procedure for the importation of plants and plant products into Algeria. Order of iay 9, 1942, reorganizing the Plant 'rotection Service and providing that the Governor General shall establish by order the conditions of entry into and movementwithin Algeria, of plants, plant parts, and other related articles. Order of November 8, 1945, as amended December 26, 1952, and variously supplemented, establishing a list of prohibited plant diseases and pests and providing that importations of most products coming from countries infested by one of the parasites may be imported only under special permit designating the method of admission. The above decrees and orders, together with other effective orders of the Governor General, including the Order of arch 13, 1947, as amended December 26, 1952, establishing new San Jose scale regulations, are summarized in the following as they apply to importations from the United States. Therre-ulations cover plants and parts thereof (fruits, seeds, seedlings, cuttings, grafts, 'oulbs, vegetables, etc. ), wrappings and containers, vinesticks and used props, soils, composts, manures, plant pathogens, and all other articles considered a hazard to agriculture. special import permits, issued in advance by the 06vernor General, are required for importations of bulbs, cottonseed, fruit, living plants and parts thereof and potatoes. Export certificates bearing a French consular visa are required with all above items. Grapevine plants and cuttings (Vitis spp.). (See par.. 12, p.
shippers declaration of origin and a sanitary certificate. (See pars. 2-3, p, 4, 7, 12, 12A and 13). nematode does not occur in the place of :roduction is also required. shipment from prohibited parasites (See par. 7, P. 5), and declaring it was produced in a place free of the golden nematode. potatoes are free from potato wart (Synchytrium endcbioticum) and vere 'roduced in e. field rt least 5 kim. distant from any infection. of nxticles =-orisinr-the sli :,,. ?ment, -and, Li ever,,r case' b-, dertificate of -cd1yto-,)athol logical itzsnection conformi.--, to tI,-a model (?--1.,12 an,,' 12-k) ado,3ted rs the Final- 'Act of the 1ate.zational I. '_,yto--_,rthological laon--ference, T (.,"-rt. Trnort permit 7nd Consulzx "is.- -_ ,eauired. Algicrs, Lone, 1,ougie., ;ostag.-ne;*qI C-cdIa ili-)--)eville. b-,:" ot. i-r o,ders suIbsequei,tly issued by t4e '..-ovarnor Gener..-,fl. 5. Upon importation, any container of articles designated in.paragraph 1 should be of such nature as to facilitate inspection,: and,if such should prove. necessary, their 6.sirfection. The. containers will be opened at the expense, risk, and jeopardy of the consignee or his agent. Each container should be plainly labled to show full name of-thb shipper, nature, kind, and quantity of products, place of origin, and name and addre'ssof consignee. .
6. Upon their importation, the articles designated in paragraph 1 shall be examined on the spot .in the Customs Office by an. official of the Plant Protection Service, w:ho, if it is :deemed necessary,.. shall proceed with their disinfection (at expense of importer). When articles for impcrtaticn are found irfested an inspection report shll be sent to the Governor General fbr communi-cation'to the administrative authorities of the country of origin. Articles' found to be infested shall be returned to the shipper or destroyed by te Customs Service, according to the Wishes of the consignee or his agent (at expense of ,importer). 8, (Order of March 13, 1947): Plants or parts of plants coming from a country infested by one of the parasites named in the preceding paragraph shall be imported only under a special permit, which shall state specifically the post offices and Customs offices designated for that purpose and the method of admission. Derogations to these provisions may be made in orders by the Governor General. 9. (Order of September 30, 1949): The importation of products capable of carrying Heterodera rostochiensis and coming from any country known to be infested, but having delimited the area of infestation, ;is authorized on condition that the sanitary certificate accompanying such shipment shall certify that such products came from areas free of the pest. 11, (Order of June 21, 1952):. The importation into Algeria of seedlings, buds, grafts, and all parts of plants of the Rutaceae family, other than the fruits, is prohibited; Provided that shipments. intended for experimental purposes shall be allowed under the con-. ditions of a permit previously issued by the Governor General. 12. 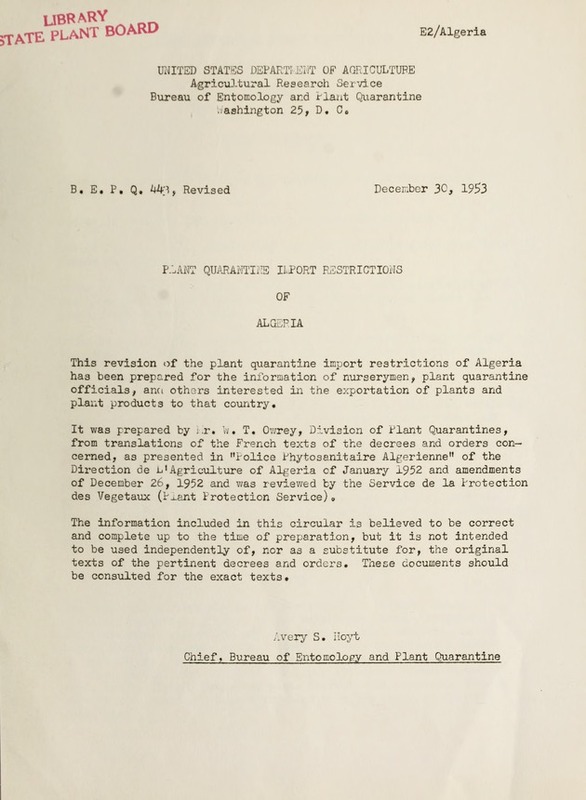 (Law of July 15, 1921): The importation into France and into Algeria of plants and cuttings of grapevines is prohibited. Greenhouse plants other than those mentioned in preceding paragraphs are inspected upon arrival and ore not (deloused) only in the instance of proved contamination. The Secretary General of the Government, the Director of Customs, and the Inspector, Chief of the Plant Protection Service ore responsible, each in whatever concerns him, of executing the present decision (decree). supervision of the Plant Protection Service. 5 km. of the place where the potatoes were produced. shnment described below are free from potato wart (Synchytrium endobioticum): and (2) that they were harvested in lEnsifuTa-fed at -east 5-km. from any place infected with potato wart. "Le scussigne, Inspcctour du Service phytopathologique a . . . certifie que (1) les pommes de terre faisant l'objet de l'expedition ci-dessus descrite sont exemptes de Gale verruqueuse (Synchytrium endobioticum); (2) cos pommes de terre ont ete recoltees dans une exploitation eloignee de 5 kilometres de tout point infeste par la Gale verruqueuse. Ces pommes de terre apjartiennent a la variete (1) . . . . qui est; (2) resistante (sensible) (a la Gale verruqueuse). Faith a . . . . . . . . . . . . . . .
Poids bruts des differents colis . . . Localite ou les pommes de terre ont ete recoltees. Date de l'inspection . . . . . .
(a) Dealer's name and address. (f) Origin (country and locality of production). The foregoing information must be reproduced in the sales contract in duplicate and also in the invoice which must be sent to the purchaser. disease mentioned in any particular ruling. and 5 percent for tubers weighing less than 65 grams. 21. Provisions of this depreeoap-ly to seed p-otatoes coming from foreign countries, imported into Algeria under the regulations for ministerial authorizations. Shipments which do not comply with the p-orescribed conditions will be returned or destroyed. 22. The importation into Algeria of dodder (Cuscuta spop.) is prohibited, -s are all seeds of forage plants, which, upon inspection, are found to contain dodder, especially seeds of alfalfa ( edicago spp. ), black medic (i. lu oulina), red clover (Trifoliunm pretense). white clover (T. re-cns)7, alsike clover (T. hybricum), kidney vetch (AntI'yllis vulnerariaj), birdsfoot trefoil (Lotus cornicul.tus), and timothy (Phleum nratense) end any mixture of seeds in which any one of the abovementioned species occurs. 23. Seeds of all types of forage plants, when declared for importation into Algeria, shall be subject, prior to being unloaded and at the expense of importers, to sampling and to an inspection for dodder, the presence of which will cause a shipment to be refused entry. 24. (Order of August 6, 1936): Exempt from inspection for.dodder for importation into'Alg6ria aie samples of seeds of forage plants intended for commerce and shipped in parcel post packages of a maximum weight of 3 kg., on condition that each individual packet of such samples enclosed in such parcel shall weigh not more than 350 gm. (Art. ..). OF . 0 & . . 0 a .* . No . . .
that the plants, parts of plants or plant products described below have been thoroughly examined, completely or a representative sample, on (date), e * . a .9 -- -**. by (Name), an authorized officer of (Service) . . . . . . . . .
Fumigation or disinfection (if required by the importing country): Date . . . . . . Treatment . . . . e .
Duration of treatment, . . Chemicals used and concentrations . Additional declaration: The examination made on the representative sample represents a percentage of .,,....... of the shipment (consignment), has shown (revealed) that the commodity thus looked at was free from San Jose Scale (Quadraspidiotus perniciosus Comst0) Done at.... the . . .19. Name, First name and address of exporter . . . . . . .
Distinguishing marks of packages . a . . . . . . Origin (if required by importing country)o . . . . . *. . Port of entry. . . . . . . . . o o . . Quantity and name of produce . . . . . . . . .